Do you want to prevent getting spam form submissions? A lot of those spam submissions are automated with bots. 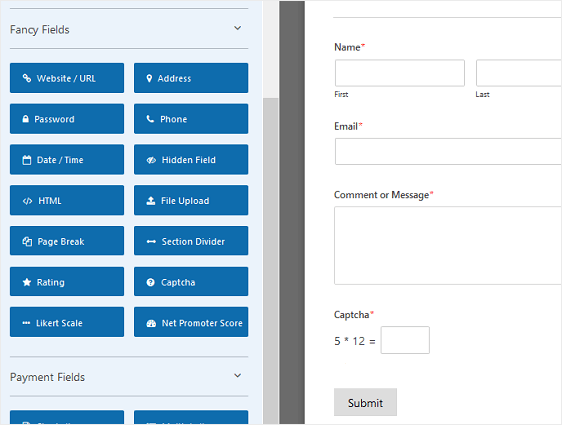 However, with WPForms, and just a few steps, you can build spam-free WordPress contact forms. 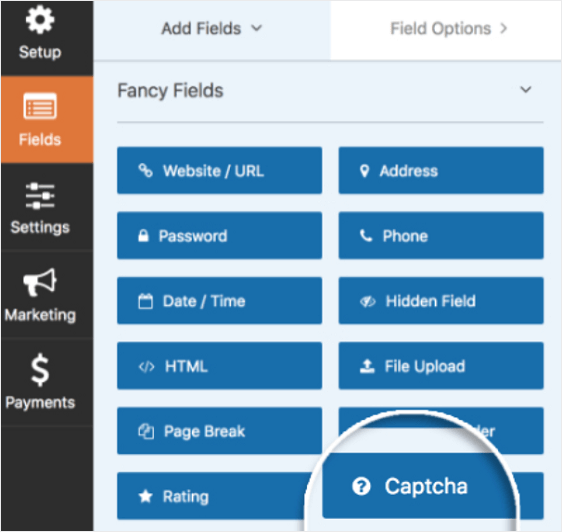 In this article, we’ll show you how to add reCAPTCHA to your WordPress forms, how to use the WPForms Custom Captcha addon, and how to create a spam-free contact form without using CAPTCHA. We’ll also share a bonus strategy that works no matter which solution you use. Here we’re going to show you how to create a contact form that will have an interactive reCAPTCHA section for site visitors to click on proving that they’re human when they submit a form. 1. Block spam – By verifying that a human is submitting a form, all automated spam attempts are blocked. 2. Easy to use – Originally CAPTCHA was created to do two things at the same time: help machines translate non-digital books and fight spam. But, the jumbled text was difficult for users to answer correctly. Google has since improved their CAPTCHA tool, reCAPTCHA v2.0, to be much easier for users. Now instead of entering text, users can just put their mouse over the checkbox and the tool understands that this is not an automated spam bot. This is much easier for users to prove that they are not robots. Now, let’s see how to add an interactive reCAPTCHA box to your contact forms. Next, you’ll need to create a WordPress contact form. For help with this step, check out our tutorial on how to create a simple contact form in WordPress. 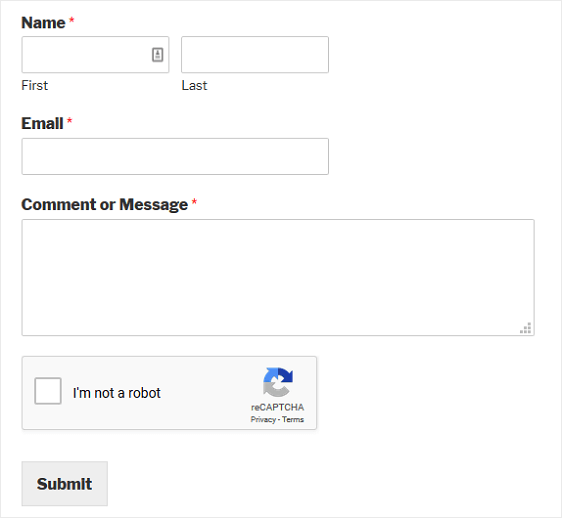 Next, you need to configure reCAPTCHA settings in WordPress. 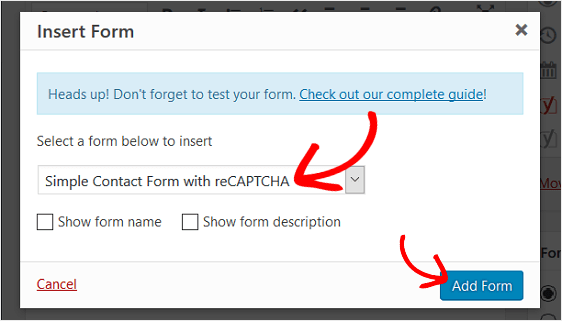 To start, go to WPForms » Settings.. Then, click on the reCAPTCHA tab. Choose v2 reCAPTCHA to add an interactive reCAPTCHA box to your contact form. reCAPTCHA is a service provided by Google. It’s free, but requires a site key and secret key. You can easily generate those keys for your site by clicking on the v2 reCAPTCHA link. Once on the site, click on Get reCAPTCHA to continue. Then, sign in to your Google account. After logging in, you’ll be redirected to a page where you can register your site for reCAPTCHA. Enter the name of your website in the label field. This is for your own use, so that you can identify the website if you ever needed to get the keys again. Then, choose the type of reCAPTCHA you want to add to your website. In this example, we’ll select reCAPTCHA v2. After that you need to add your website’s domain, such as example.com. To save your site, click the Register button. Next, you’ll see a page with a site key and secret key for your website. Copy your site and secret key, and switch back to the WPForms » Settings page. Paste your site and secret keys under the reCAPTCHA settings. Click on the Save Settings button to store your changes. 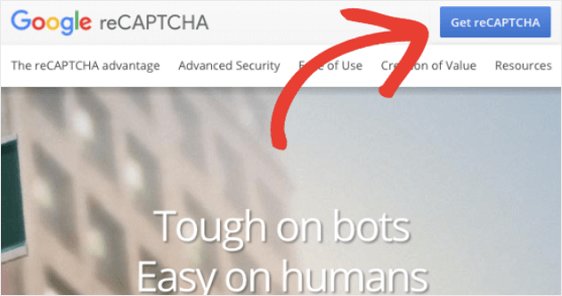 Adding reCAPTCHA to your WordPress form is easy to do. To enable reCAPTCHA in the simple contact form you created earlier, go to Settings » General in the form editor. At the bottom, click Enable Google reCAPTCHA (v2). Now you can add your contact form, complete with Google reCAPTCHA, to your website. If you don’t want to use Google reCAPTCHA v2, but know you want to add an interactive reCAPTCHA element to your website, you can always use our Custom Captcha Addon. With this addon, you can define custom questions or use random math questions as CAPTCHA to fight spam form submissions. Next, go to WPForms » Addons and find the Custom Captcha Addon. Install and activate the Custom Captcha Addon. 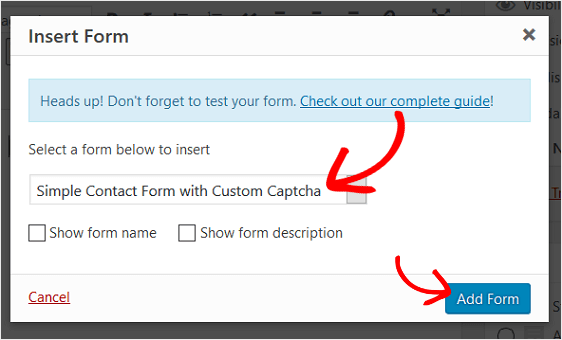 Once you’ve created a contact form, stay in the form builder to add your custom captcha form field. Just drag it from the left hand panel to the right hand panel to add it to your form. The form field will automatically display a random math question for site visitors to answer before they can submit their form on your site. A new addition, subtraction, or multiplication problem will appear every time the page loads or refreshes. For help customizing the Math Captcha, check out our documentation on how to change the Math Captcha. To make changes to the form field, click on it. Now you can change the label, type of captcha, and add a description. 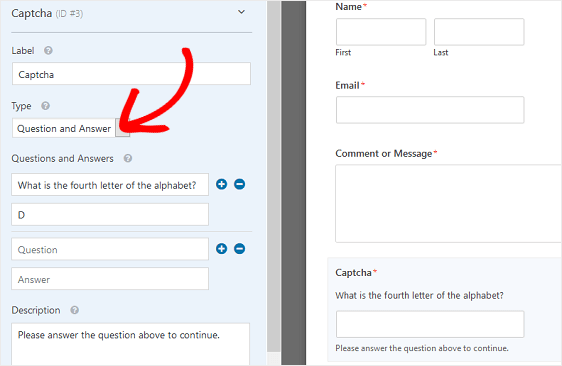 If you prefer to use a custom question and answer instead of the Math Captcha, change the type of captcha to Question and Answer in the Field Options section. There, you can also change the question and answer that site visitors have to answer to submit their form on your site. If you want to display random questions and answers every time your page loads or refreshes, click on the plus (+) button to add another question and answer. Click Save when you’ve customized your custom captcha. 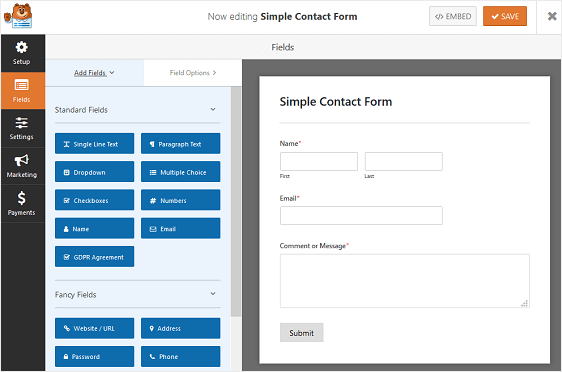 You’re now ready to add your contact form to your website. Here we’ll show you how to build a spam-free contact form in WordPress without reCAPTCHA so the user experience is never disrupted and filling out your forms is as easy as possible. To protect your site, you want to make it as easy as you can for your visitors to fill in your contact form, while making it as hard as possible for spambots to get through your security. One of the most common ways to stop spambots is to use a form field that only a human could answer, called CAPTCHA. CAPTCHA usually requires users to enter specific text into a box. 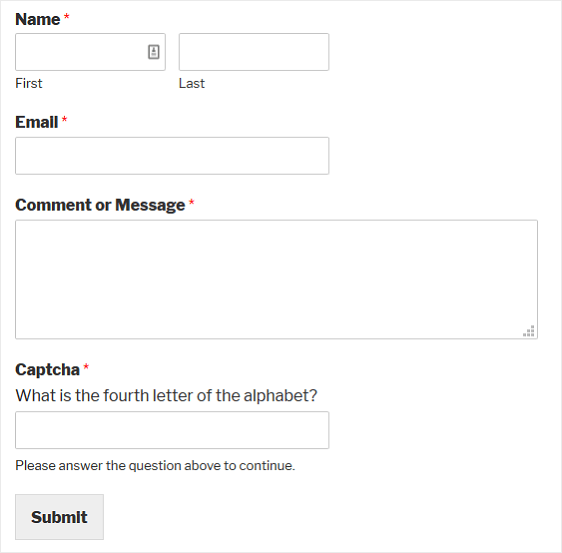 Though our Custom CAPTCHA Addon works a bit differently by creating a field that asks a user to solve a simple math problem or answer a question correctly, this can still be an extra step that frustrates the user and may decrease form submission rates. Users may not want to take the time to answer irrelevant questions. And, some users may have difficulty answering math questions or reading CAPTCHA text, especially if they have dyslexia or other disabilities. Luckily, it’s easy to create a spam-free contact form without CAPTCHA using WPForms. 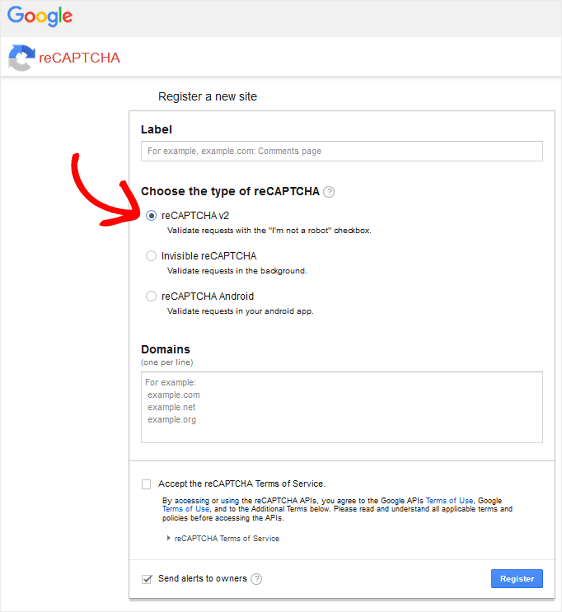 Next, you need to configure reCAPTCHA settings within WordPress. Choose Invisible reCAPTCHA to add Invisible reCAPTCHA to your contact form. reCAPTCHA is a service provided by Google. It’s free, but requires a site key and secret key. You can easily generate those keys for your site by clicking on the Invisible reCAPTCHA link. You’ll be asked to sign in with your Google account. After logging in, you’ll be redirected to a page where you can register your site for reCAPTCHA. Then, choose the type of reCAPTCHA you want to add to your website. In this example, we’ll select Invisible reCAPTCHA. 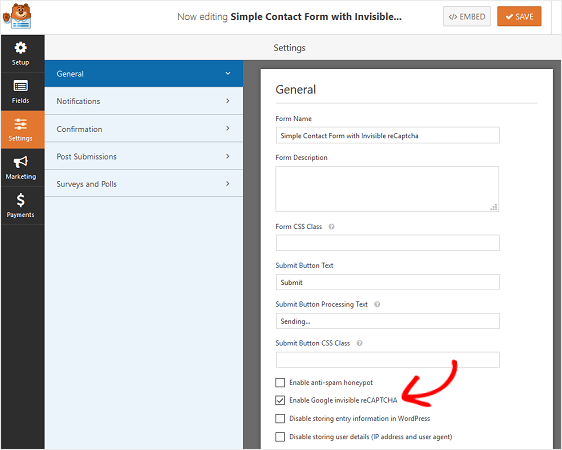 Copy your site and secret key, and switch back to WPForms » Settings page. 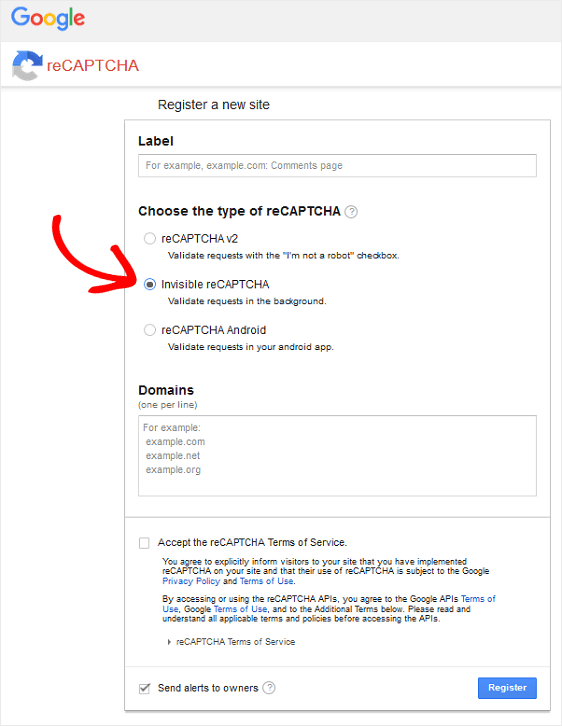 Paste your site and secret keys under the reCAPTCHA settings. To enable the Invisible reCAPTCHA on your contact form, go to Settings » General in the form editor. Then, scroll down and click the Enable Google Invisible reCAPTCHA checkbox. Now any time someone tries to submit a form on your website, Google will determine whether it’s a spambot trying to submit a fake form or not. Your users, however, will never see anything related to captcha and will simply submit their form without any issue. 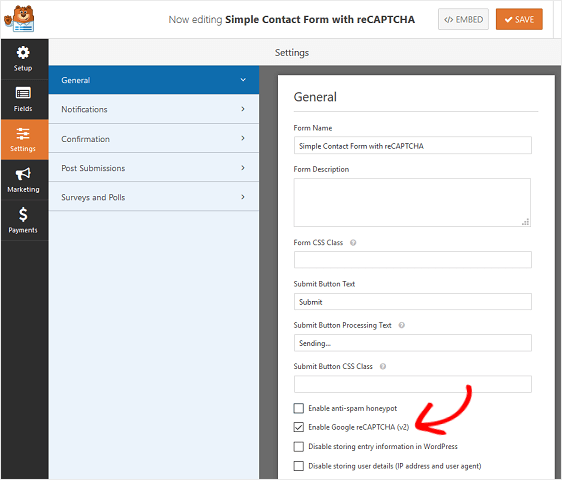 There is a hidden way to secure your contact forms without using CAPTCHA of any kind in WPForms. This hidden tool is called a honeypot. Basically, a spambot fills in a hidden field that valid users can’t see. This extra field of data verifies that the submitter is a spambot, not a user. When the honeypot field is filled in, the form is rejected as spam. The spambot gets stuck and can’t submit the form. Honeypots are great because they don’t bother users like a CAPTCHA field and they are a secure tool for stopping spambots. By default, this setting is enabled for all your forms, even if you use other anti-spam strategies such as Google reCAPTCHA, the Custom Captcha addon, or Invisible CAPTCHA. If you want to double check that it’s activated, you can go to Settings » General. Then, near the bottom of the right-hand preview panel, you’ll see that the Enable anti-spam honeypot option is selected for you. And there you have it! 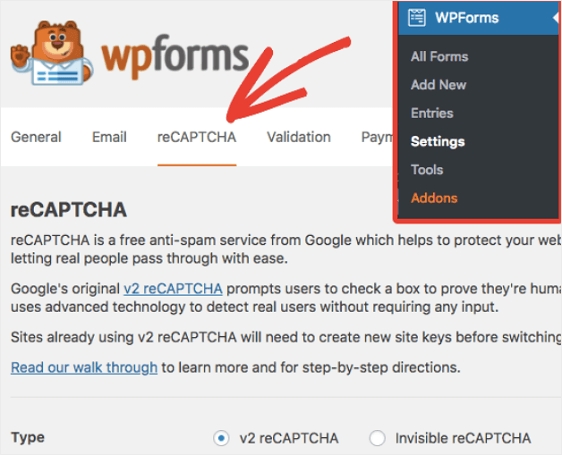 You now know how to build spam-free WordPress contact forms using Google reCAPTCHA, Invisible reCAPTCHA, and our very own WPForms Custom Captcha addon. Plus, you know all about the anti-spam honeypot feature that all WPForms have. Do you need to stop user registration spam? You might also want to check out our guide on simple tricks to eliminate spam user registration. Why this option existe any more ? In most cases captchas aren’t needed as we include an anti-spam honeypot field by default, however in scenarios additional protection is required or helpful. In those situations we believe Google’s reCATPCHA is the best, though some users want more control over their captchas (Google offers basically none). This addon provides an alternate captcha method with more control. Recatpcha is not showed in the form. Thank you, helpful so far. and Step 2: Server Side Integration. Can you please explain if we need to do this copy/paste with the snipets, and if so, how? We’ve got built-in integration with reCAPTCHA, so you don’t actually need to touch any code snippets at all to use it with our forms. As long as you grab the keys mentioned in this article, and then turn on reCAPTCHA for each specific form where you’d like it, you’ll be all set! i have followed the steps but there’s always an error – Incorrect reCAPTCHA, please try again. I’m sorry to hear you ran into issues with this. When we see issues like what you’re describing, it’s usually because another plugin (or sometimes even the theme) is loading a duplicate set of reCAPTCHA code — which will break the captcha functionality and display an error like you described. The best way to check for a duplicate code source is to go through your plugins and look for anything that might have its own reCAPTCHA code loading, then to check theme settings to see if it could be coming from there. If you aren’t able to find where else reCAPTCHA might be loaded from, WPBeginner has a great tutorial on troubleshooting that would work well as an alternative. Or, if you’d prefer to avoid troubleshooting and go for a quick and simple solution, I’d suggest using WordPress Zero Spam. It doesn’t require any setup, isn’t visible in forms, and works really well. Does WPForms support multiple forms with recaptchas on the same page? I just ran into an issue with Ninja Forms where only a single form on a page may contain a recaptcha. Great question. Yes, WPForms does support multiple reCAPTCHAs on the same page. The caveat is they do need to all be reCAPTCHAs from WPForms. For example if you have a form on your contact page with a reCAPTCHA and a form in your sidebar with a reCAPTCHA, there will be no issues. Due to the way reCAPTCHA works, if you run multipe reCAPTCHAs on the same page with different sources, you’ll encounter a problem. For example, if one reCAPTCHA was generated by WPForms and another reCAPTCHA was generated by you theme, they will likely conflict. This is mostly personal preference. Both types of reCAPTCHA use the same technology, but they look different on your site. Custom Captcha is a simpler setup, and doesn’t require that you have a Google account. WPForms has built-in integration with reCAPTCHA, so you don’t actually need to work with any code snippets to use it with our forms. As long as you grab the keys mentioned in this article, and then turn on reCAPTCHA for each specific form where you’d like it, you’ll be all set!